I've been invited to do sketch cards for the series that will be released this fall. I'll be making a few updates as I go but the deadline is super tight. 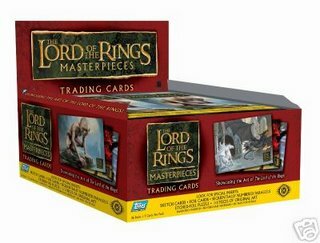 "On October 4th, Topps will release Lord of the Rings Masterpieces. This 90-card set will feature art from production paintings, costume designs, EA's XBox360 The Battle for Middle-Earth2 game, caricatures, and newly commissioned art. Insert sets will include Silver Foil Art cards from the end credits of the Return of the King (plus Hobby Exclusive Bronze, Gold, and Refractor Parallel sets), Hobby Exclusive One-Of-A-Kind Hand-Drawn Artist Sketch cards"
I'm still recovering from Comic Con but feeling pretty good, I had a very good time and hung out with some great people. More about that later. I was invited to be a sketch card artist for The Lord of the Rings Masterpiece collectible card series coming up this fall. I'll be holed up for a while but will try to update here and there and assure everyone that I've not fallen into the abyss of hand-cramp hell. That's great news! Best of luck. I'll do my best as always! Wow, cool gig to get. Congrats! Cool!! good luck!!! Can I have some of your work? Can I have some of your work? I just might have to buy LOTR sketch series. Congrats. Pfft. I'm not reading it, then.